The Belkin N+ Wireless Modem Router is a pretty large router in comparison to most and goes for a vertical instead of horizontal design. While this makes it more obtrusive, the twin antennas have a better range as a result. The black box comes with an integrated stand and has a simple but pleasing look. On the front you'll find blue LED lights that signify when a connection is held; should it flash amber you'll know you have a problem. There is also a Download strip, showing you how heavily your router is being accessed. You'll find a WPS (Wi-Fi Protected Setup) button that allows you to connect instantly with other WPS machines on the network. On the rear, you'll find four standard Ethernet ports and an ADSL connection. There is even a USB Storage Port, so you can connect a NAS (Network Attached Storage) device, such as an external hard drive, allowing you to share data around the network with a minimum of fuss. There is also a reset button should you need to use it. 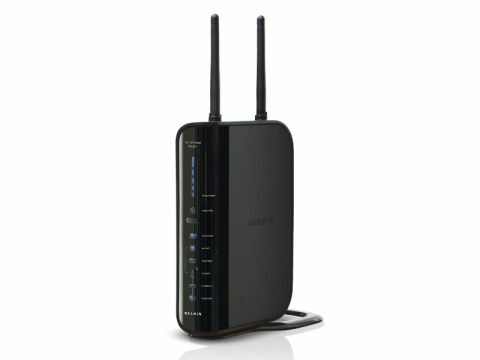 A wizard makes simple work of setting up the Belkin router. Settings and security login are handled through a browser window and changing these settings is relatively easy. Since its release in 2008, new firmware has been released for the device and, while all current models come with version 1.00.03, it's worth checking with the Belkin site for the upgrade. It's a 1.3MB download, and helps stabilise the router software. Naturally, you'll only get 802.11n data speeds if your laptop has the technology built in. We used the Belkin N+ Wireless USB Network Adapter, which has the same stand design as the router itself, and we found the router performed extremely well. The only factor that lets this package down is the price, which at £150 for both parts is somewhat excessive. That said, if you're willing to pay the price, the Belkin N+ Wireless Modem Router is a great router that offers outstanding performance and reliability.